The Place: A big, hip and handsome bar that is very, very dark. The Time: Monday, October 29th 7:00 pm. I work from home several days out of the week, and I have a bad habit of working in my own apartment, which leads to me being stir crazy by 5. So lately I’ve been cheating on my apartment with the coffee shop around the corner. Seems like a promising relationship so far. But regardless of where I’m working, I can generally use a stiff drink after eight hours of internet searches and rejection letters. I remembered my roommate recently told me that a local bar I never paid much attention to is now selling CBD infused syrups in their cocktails. As a self proclaimed lover of adventure, this seems like a great opportunity to try something new on an otherwise monotonous Monday. The Vibe: As I mentioned, the bar is very dark. If you like reading in bars and you don’t read on a Kindle or another lit device, you will be disappointed. Otherwise, it’s very cute with all the marks of a hip Brooklyn spot and then some - plants, exposed brick, an enclosed backyard area, and a big projector playing a black and white film in the back. There aren’t many people in the bar this evening, but I can easily see it filling up on weekends. 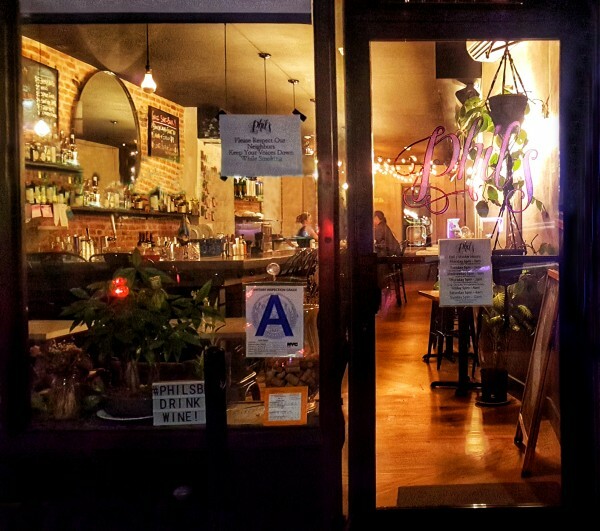 Phil’s is a strong indicator that this currently sparse area of Bushwick will soon be a very popular neighborhood. I sit on a stool at the end of the bar, admiring the Halloween decorations spreading across the chalkboard menus (I’m a sucker for anything festive). I’m intrigued by the spiked hot cider but I’m here on a CBD infused mission, which I don’t actually see on any menu except the sandwich board set up outside. It’s a very know-what-you-want kind of place; the menus on the wall are more suggestions than a cohesive list of offered items. I don’t know what I want so I ask the bartender to brew me up a potion with an available CBD syrup. The Bartender: A very nice man with an infectious smile, who not only doesn’t seem annoyed by my lack of certainty, but is downright excited to have a chance for some cocktail making creativity. He greets everyone heartily when they walk in, and he talks booze-shop with many of the patrons who are obviously either regulars or friends of his. He has a knack for making people feel at home, and is clearly passionate about his work. 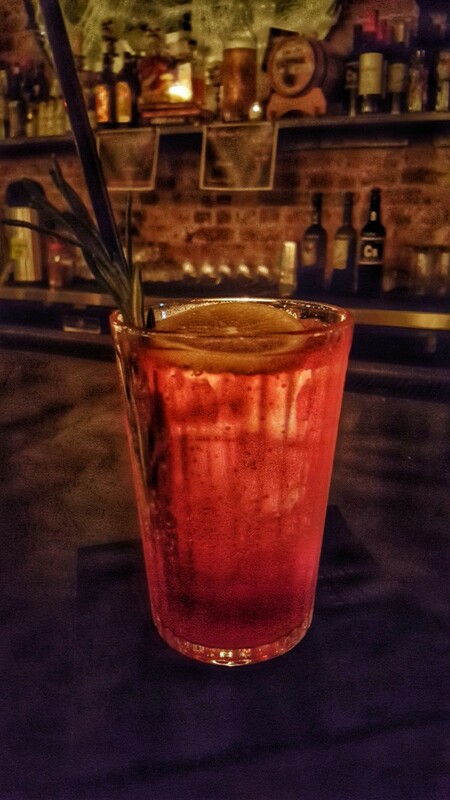 The Drank: My friendly bartender makes up a drink of rosemary vodka, Campari, beet and honey CBD syrup, bitters and soda water. He says the CBD syrups are viciously sweet, but as someone who is not a fan of sweet drinks, I feel this blend of ingredients does a good job of taming the sweetness. It’s well balanced and well priced at about $10. I’ve had CBD in coffee and tea and found it counteracts the caffeine nicely, but this is my first experience with CBD in alcohol. I can say I do feel more relaxed (a state I’m grateful for after a long and grueling Monday) but whether that’s really a product of the CBD or of the booze, I can’t say. Was I Hit On? Not at all. In fact, I’m totally ignored by everyone except the bartender. I am left alone to enjoy my drink and my Kindle in peace. I feel very comfortable, and while I wouldn’t mind some casual conversation after a fairly solitary work day, I’m grateful that everyone in the bar is respectful of my space. Should You Drink Here Alone? On weekdays, totally. Phil’s is a nice, relaxed spot with a lot of room and and friendly people. Based on the setup of the bar and the conversations I heard between bartender and barback, I have a very strong suspicion that it is not this quiet and chill on weekends. I’m not totally sold on the CBD/alcohol combo, but Phil’s is a versatile place that has something for everyone.